The first-ever World Series of Poker double stack event concluded on Thursday with local high-stakes poker pro Robert Peacock claiming his first gold bracelet, along with a bankroll boost of $644,244. Peacock marched to victory armed with a rowdy rail, complete with signs and champagne bottles. His supporters, comprised mostly of other local cash game pros including Danielle Anderson, Mike Del Vecchio and Jesse Sylvia, was so dedicated in fact, that they all returned for today's unscheduled Day 5 noon restart to watch Peacock finish it out, chanting and popping bottles along the way. After busting his first bullet just before the end of Day 1a and getting short but doubling just before the end of 1b, Peacock proceeded to run good on Day 2 and started feeling like this might just be his tournament to win coming into the third day. Used to high-stakes cash games both in his home state of New York and in Las Vegas for the last six years, Peacock seemed very calm and unaffected by the high-pressure final table situation. He stayed cool and collected throughout the final table, continuing to run good in important spots. Couple that with his boisterous supportive rail, and the win seemed inevitable. Robert Peacock had quite the rail at the final table of Event #34. Event #34: $1,000 DOUBLE STACK No-Limit Hold’em drew a massive 5,700 entries that all received 10,000 starting chips rather than the typical 5,000 for typical $1K events. A total of 855 players would finish in the money to get a piece of the $5,130,000 prize pool, with all final tablists guaranteed a minimum of $56,891. 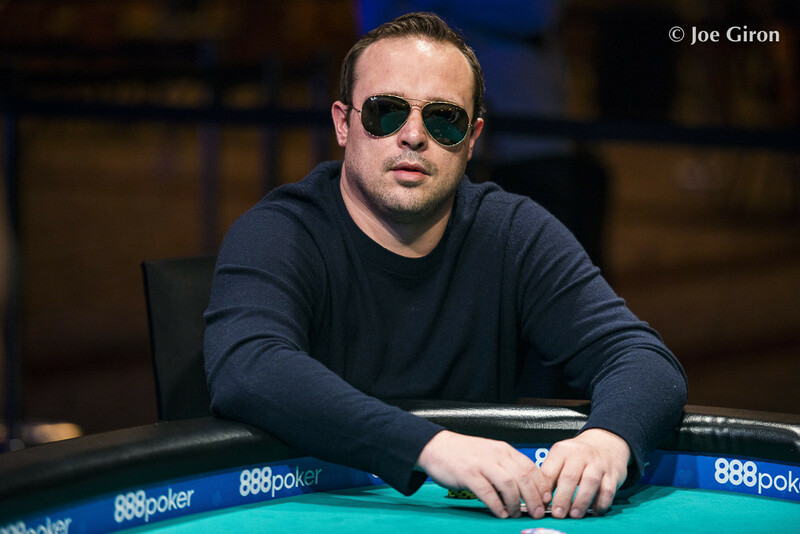 After two starting flights and three full days of play, only 20 remained with Keith Ferrara sitting atop the counts and Peacock third in chips. 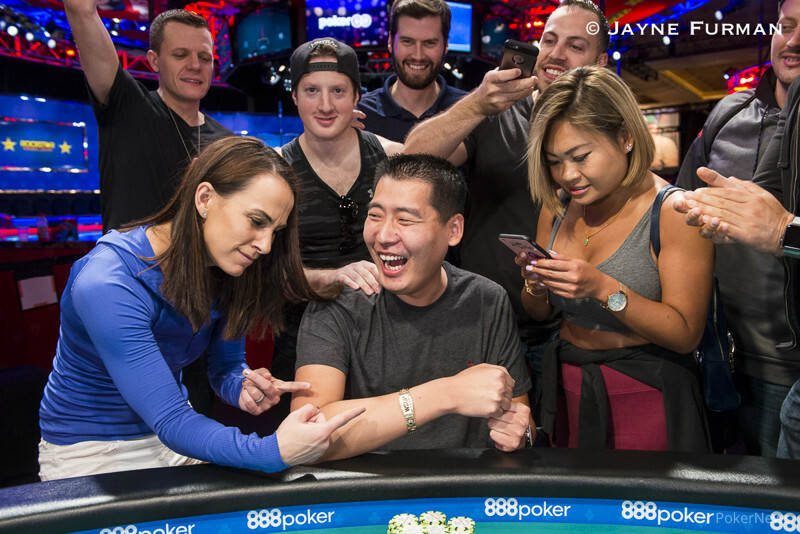 Some big names to not make the cut on Day 3 included Jake Bazeley (141st place), WSOP bracelet winners Phil Hui (107th place), Anthony Spinella (101st place), Nipun Java (87th place), and Tony Dunst (69th place). Also busting in the money on the third day were Maria Lampropulos (79th place), Isaac Baron (66th place), Mike Del Vecchio (51st place), and Matt Berkey (24th place). Only three players would survive the fourth day of play. Falling short of the final table were bracelet winner Andrey Zaichenko in 18th ($27,689), Ramin Hajiyev in 15th ($34,929), Matt Stout in 12th ($44,407) and Ferrera in 11th ($44,407). 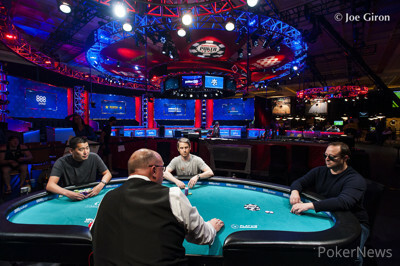 With the elimination of Tomas Teran Paredes in tenth, the official final table was set. 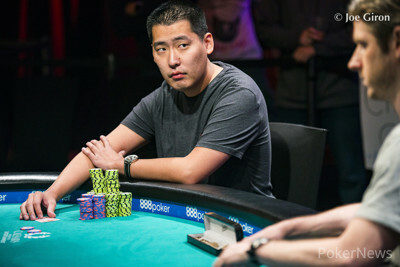 The final table got off to a slow start, taking three hours to send out the first casualty which was Takao Shimizu, who busted just before the dinner break. Pfizer Jordan hit the rail in eighth, followed byJames Ostrowski, who ran pocket sixes into the nines of Daniel Eichhorn to knock him down to five big blinds and he was out the next hand. Down to six, Eichhorn found himself riding a short stack and got in his last 11 bigs with king-eight when it folded to him in the small blind. Unfortunately for him, Ralph Wong woke up with pocket queens in the big blind and snapped him off, sending him out in sixth for a six-figure payday. 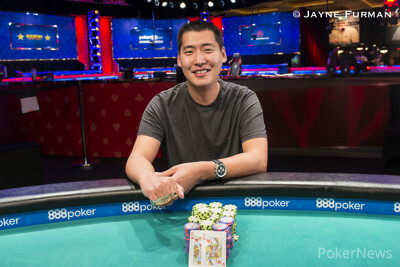 After several rounds, Wong dwindled to around ten big blinds and got it in from the small blind with jack-seven, only to run into Joshua Turner’s king-jack in the big blind. Turner found a king on the turn to lock up the hand and Wong had to settle for fifth. 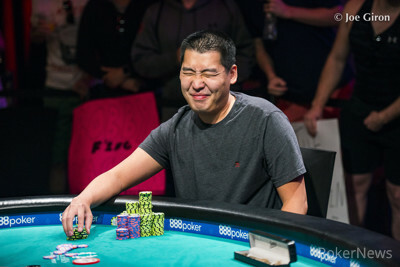 Jacky Wong became the fourth-place finisher after getting in his remaining stack with pocket sevens against Peacock’s ace-six. Peacock flopped a six and rivered an ace though to get them down to three, Peacock holding a sizable lead over Turner and Nicholas Salimbene. Though Turner was vying for the chip lead, a couple big confrontations with Peacock didn’t go his way, and he became short. Though he found a triple-up with a flopped set of nines to get him out of the danger zone, he was the shortest of the three when play was halted at the end of 10 levels. Peacock came into the unscheduled fifth day as the overwhelming chip leader with 38 big blinds to Salimbene’s ten bigs and Turner’s eight. Turner got it in on the sixth hand of the day with king-queen, called by Peacock’s pocket threes. He couldn’t find help from the board, though, and the six-time WSOP Circuit ring winner had to settle for third place and his best live cash of $294,760. Six-time Circuit ring winner Joshua Turner fell in third place in Event #34. Although a very short Salimbene found a double-up heads-up, he was soon at risk again after shoving with king-deuce on the button, called by Peacock with king-queen suited in the big blind. Both made two pair with a pair and a king on the board, but Peacock’s kicker played to end it all. Peacock ran to his rail and celebrated, with Salimbene also getting some love from the crowd before heading to collect his $397,908 payout for the runner-up finish. As for Peacock, he’ll be sticking mostly to his high-stakes cash games just like before, armed with some extra ammo. We can, however, expect him to show for the Main Event, hoping to improve on his one min-cash in 2015. "I'll play a few [tournaments] here and there, but I still prefer cash," said Peacock. 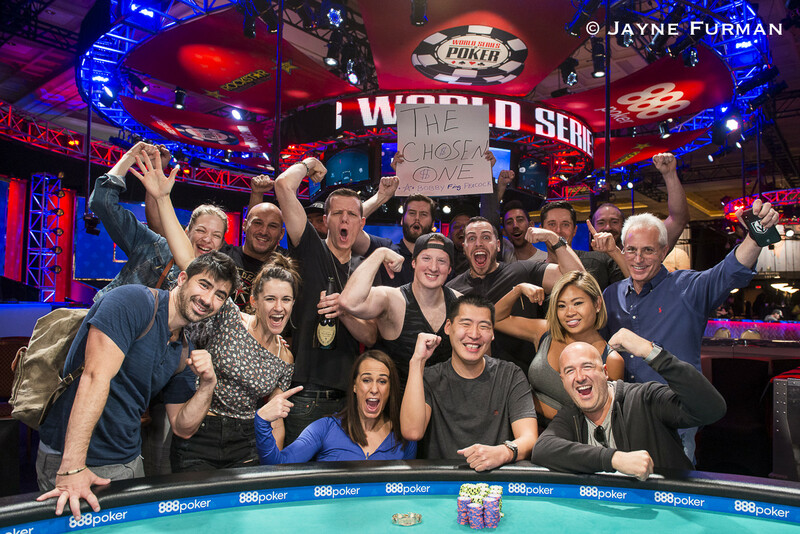 While Event #34 is a wrap, there's plenty more WSOP action underway and still to come. Keep it at PokerNews for more live updates from the Rio through the conclusion of the series. Hand #218: Down to just under 11 big blinds, Nicholas Salimbene moved all in from the small blind and Robert Peacock quickly called out of the big blind. Salimbene was dominated and in need of help to remain in contention, and he picked up some chop outs on the flop. The turn was as bad as it could get for Salimbene, who was drawing to a chop only now and couldn't win the hand outright anymore. A blank on the river let Peacock's rail erupt in celebration and he shook hands with Salimbene before embracing them. 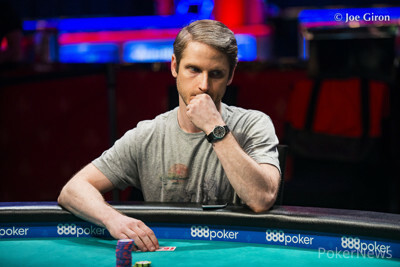 Salimbene was eliminated in 2nd place and takes home $397,908 for his efforts, while Peacock scored his first gold bracelet and a payday of $644,224. A recap of today's action and the event is to follow. Hand #213: Robert Peacock limped in and Nicholas Salimbene moved all in. Peacock folded. Hand #214: Salimbene min-raised to 2 million and Peacock moved all in. Salimbene folded. Hand #215: Peacock moved all in from the small blind. Salimbene forfeited his big blind. Hand #216: Salimbene raised to 2 million once more, then Peacock moved all in and forced a fold. Hand #217: Peacock moved all in from the small blind. Salimbene folded and was left with around 11 big blinds. Hand #206: Nicholas Salimbene raised to 2 million and Robert Peacock called. On the flop, Peacock checked and Salimbene continued for 1.2 million, which Peacock called. The turn and river were checked through. Peacock showed , Salimbene turned over his , and they chopped it up. Hand #207: Peacock raised to 2 million and Salimbene called. On the flop, Salimbene checked and folded to a bet worth 1.5 million. Hand #208: Peacock got a walk on the button. Hand #209: A walk for Salimbene. Hand #210: Salimbene made it 2 million on the button and Peacock let it go. Hand #211: Peacock raised to 2 million on the button and Salimbene folded. Hand #212: Salimbene raised to 2 million on the button and Peacock called in the big blind. The flop came and Peacock led 2 million. Salimbene called and both players checked the on the turn. The river was the and Peacock bet 4 million. Salimbene let it go and Peacock took the pot. Hand #202: Nicholas Salimbene moved all in for 8.5 million and Robert Peacock folded. Hand #203: Peacock jammed from the small blind and Salimbene let go. Hand #204: A walk for Salimbene. Hand #205: Peacock moved all in from the small blind and Salimbene called for 9.6 million in the big blind. 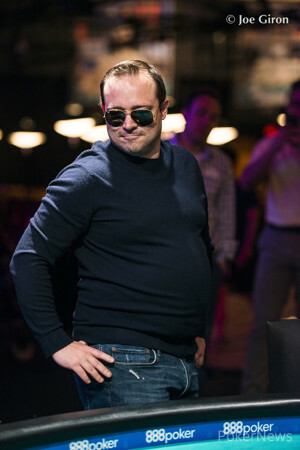 The flop gave Salimbene a lock on the hand, and Peacock turned around to his rail and said "he got it." The turn and river were already meaningless and Salimbene doubled to 18 big blinds. Hand #201: Joshua Turner moved all in for 6.6 million on the button and Robert Peacock called in the small blind to put him at risk. Nicholas Salimbene folded and cards were on their backs. It was a flip, Turner needing help. The board ran out — no help for Turner, and he was out in third place. The six-time WSOP Circuit ring winner takes home $294,760 for his efforts and left with handshakes and smiles all around. Peacock and Salimbene now prepare for heads-up, with Peacock well out in the lead. Hand #196: Nicholas Salimbene moved all in from the small blind and Joshua Turner forfeited his big blind. Hand #197: A walk for Robert Peacock. Hand #198: Peacock moved all in from the small blind and Salimbene folded in the big blind. Hand #199: Peacock moved all in from the button and claimed the blinds and antes. Hand #200: Turner moved all in from the small blind for 5.4 million and Peacock sent his cards into the muck. An unscheduled Day 5 will see three players out of a 5,700-entry strong field return to the Rio All-Suite Hotel & Casino in order to determine a champion in Event #34: $1,000 DOUBLE STACK No-Limit Hold'em. Despite the request of the remaining three hopefuls and a boisterous rail at the end of the night on Day 4, the chips were bagged and tagged after 10 full hours of play, meaning a winner will be determined today. Robert Peacock will be the overwhelming chip leader with 38,200,000 chips when the action resumes at 12 noon local time with blinds of 500,000/1,000,000 with a running ante of 100,000. Nicholas Salimbene follows in second place with 10,400,000 and Joshua Turner has 8,400,000 heading into the final day of the event. Among the three finalists, Turner has racked up the most merits at the WSOP so far with six WSOP circuit rings and 60 cashes to his name for more than $760,000 in total earnings. 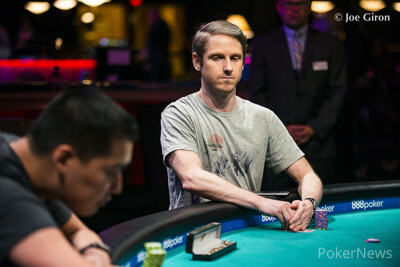 Peacock, who was supported by a growing and very vocal rail, is mainly a cash game player with some tournament results in Las Vegas as well. This will be by far his largest tournament cash to date and he is in a commanding position to capture a first World Series of Poker gold bracelet and the payday of $644,224 that comes along with it. The third-place finisher will be rewarded with $294,760 for his efforts and the runner-up will win $397,908. Stick close, as the PokerNews live reporting team will provide hand-for-hand coverage until a champion is crowned when the cards get back underway.